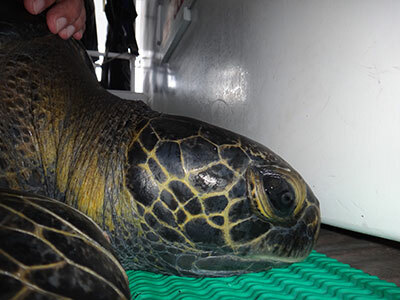 A Pacific green sea turtle satellite tagged in Costa Rica’s Cocos Island National Park, has made a historical migration to Ecuador’s Galapagos National Park. Named Sanjay by researchers, the 117-pound male, is the first sea turtle to corroborate preliminary genetic data suggesting many of the resident sea turtles at Cocos Island were born on the nesting beaches of the Galapagos Islands located 400 miles south. Sanjay was one of two endangered green sea turtles (also known as Eastern Pacific black turtles) captured in June during a Turtle Island Restoration Network and PRETOMA expedition to elucidate sea turtle and shark migration routes and their use of marine protected areas. It only took Sanjay 14 days to make the historic swim boosting a growing evidence of an important migratory ‘superhighway’ for many marine species in need of better protection including hammerhead sharks, leatherback turtles and silky sharks supporting calls for the creation of a marine protected “swimway” connecting these two UN designated International Biosphere Reserves. Such a “swimway” could provide go a long way toward successfully protecting endangered marine species in the face of threats from intense industrial fishing including longline vessels that place tens of millions of hooks in the Pacific each year. 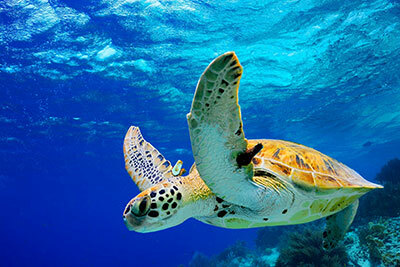 Sea turtles and sharks are protected in the relatively small marine sanctuaries that surround these internationally recognized marine island gems, but fall victim to fishing hooks and nets as they attempt to migrate between these safe havens. 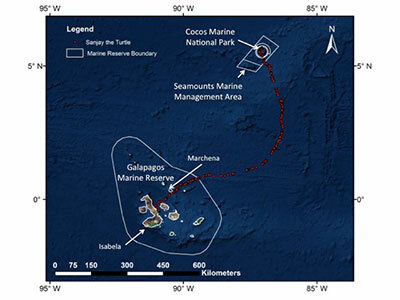 To this end Turtle Island Restoration Networkand partner organizations have tagged 101 sea turtles at Cocos Island (24 with satellite transmitters and 46 with acoustic tags) since 2009. Our joint research program is documenting how endangered sea turtles and sharks use Cocos Island and Galapagos National Park marine protected areas in order to understand the biological connectivity between these two sanctuaries. Sanjay, the sea turtle, joins several hammerhead sharks, a silky shark, and a Galapagos shark that have been proven to spend time at both of these reserves. Costa Rica and Ecuador could make history by creating a bi-national peace park swimway that offers safe passage to these migratory species! If you are an experienced scuba diver and would like to join a future expedition (Dec. 9 – 19, 2014, Feb. 11-21, 2015, or July 18-28, 2015) to Cocos Island as a citizen scientist, visit SeaTurtles.org/expeditions. 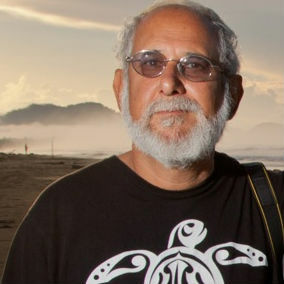 Todd Steiner is an ecologist and the founder and executive director of Turtle Island Restoration Network (SeaTurtles.org), an ocean advocacy and research NGO with offices in California and Texas. He has more than 30 years experience in environmental protection and education. He currently serves on the IUCN Marine Turtle Specialist Group, the Cordell Bank National Marine Sanctuary Advisory Counsel, NOAA-DFG Priority Action Coho Team: Technical Working Group, and on the Center for Biological Diversity Board of Directors. He holds an MS in Biology and lives in Forest Knolls, Calif. Thank you for the comment. I suggest that your wife check in with her personal physician and seek advice. I have a question, my wife has High blood Pressure but wants to do a beginner scuba dive class. We were told she couldn’t because she had HBP.